WASHINGTON (CNS) – Although the current sexual abuse crisis in the church is similar to what the church faced in 2002 when reports of past abuse and cover-up came out of Boston, Mass., how Catholics are responding this time is different. Beyond echoes of anger and frustration from years ago, many Catholics are demanding real change, transparency with church leaders and more lay involvement, particularly from women. These views came across during the Oct. 24 panel discussion at Georgetown University called: “A Path Forward on the Clerical Sexual Abuse Crisis,” sponsored by the university’s Initiative on Catholic Social Thought and Public Life. The panelists and audience members, a mix of older Catholics and Georgetown students, spoke about their sense of betrayal and distrust of church leadership, but they also stressed that they don’t intend to walk away from their faith or the church they love. The recent onslaught of allegations of past sexual abuse in the church and claims they were sometimes covered up hit Catholics that had already dealt with painful sexual abuse charges against its leaders more than a decade ago and for many young adult Catholics, this has been the first time to fully take in these types of allegations. These revelations also come in the midst of a societal #MeToo movement calling out both sexual abuse and abuse of power. 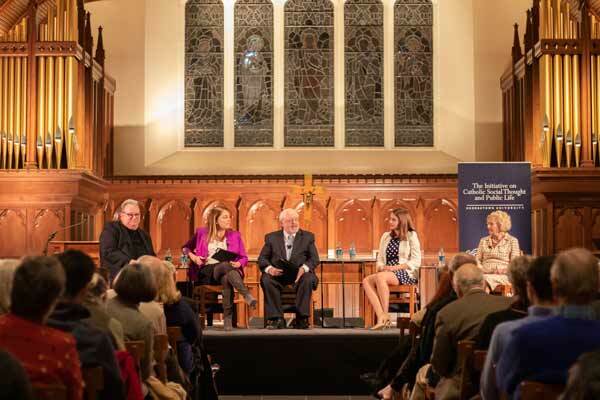 The event at Georgetown University’s Dahlgren Chapel was just a slice of the church at large, but its panelists reflected varying degrees of frustration and optimism. The panelists were: a university student, a priest who is a psychologist and has worked both with survivors and perpetrators of clerical sexual abuse; a justice on the Supreme Court of Illinois who was interim chair (2002-2004) of the U.S. Conference of Catholic Bishops’ National Review Board, which monitors implementation of the “Charter for the Protection of Children and Young People”; and a director in an organization that promotes best practices and accountability in U.S. Catholic Church management. Justice Anne Burke, who serves on the Illinois Supreme Court and was National Review Board interim chair starting in 2002, the year this group was formed, said she has not seen much change in church leadership since her role at the cusp of the initial crisis. And now with the increased number of dioceses receiving subpoenas to turn over their records, she said: “I suspect there will be more,” and advised other dioceses to be pro-active and hand over files instead of waiting to be required to do so. Burke said she was not optimistic about future changes, but she felt emboldened in her own faith in recent weeks and was further convinced that lay people need to take an active role in parish and diocesan boards. Erica Lizza, a 21-year-old senior at Georgetown and president of the Catholic Women of Georgetown, said she was in kindergarten during the 2002 church abuse crisis, so she didn’t know much about it, and for her peers, the current crisis has been the last straw for many of them, to stay in the church. For those like her who are staying, she said: “Young people want change and they want it now.” She believes this can begin only after church leaders have their own examination of conscience and make small steps to show their concern. For example, she thinks her own university should take away the honorary degrees it gave to Archbishop Theodore E. McCarrick as some other Catholic colleges have done. He also acknowledged that the “pain of this moment” in the church is powerful to him and to all Catholics and said healing and recovery would only come about as part of a cultural change. Kerry Robinson, the founding executive director and global ambassador of the Leadership Roundtable, a Washington group that promotes best practices and accountability on management in the U.S. Catholic Church, said her group has been working with Catholic leaders to put forth a blueprint for a way forward. But she said gatherings like this one, where students in the question-and-answer session asked what they could do to help the church, gave her hope. Lizza, the college panelist, said the anger so many have expressed about this church crisis is “not a bad thing,” noting that Jesus got mad about moneychangers in the temple. He said that just as one of the panelists said she wasn’t leaving her faith, he wasn’t leaving either. Carr pointed out the good work the church does in ministry, education, service and defense of human dignity from the unborn to “undocumented,” reminding everyone of what’s been done and needs to continue.